Designed to accommodate several rental profiles, Bentley Ridge offered four plans to meet the needs of young families, single persons and retirees. 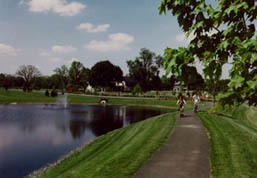 The 50 acre site was planned for 422 units organized into a unique land plan consisting of �villages� of approximately 50 units, with each village oriented towards a common green. Parking was located away from the fronts of the buildings allowing sidewalks to entry doors. Single floor living ranges from 770 to 993 square feet and two-story living starts at 1122 square feet.